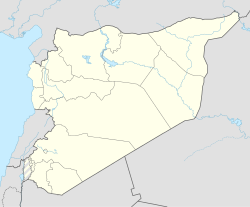 Qirq Maghar, also spelled Qirqmaghar or Qarah Mughar, is a village located 15 kilometers (9.3 mi) south of Jarabulus in northern Syria. SDF seized the village from ISIL in June 2016. ^ "Military Situation near Syria's Manbij on June 14". SouthFront.org. 14 June 2016. This page was last edited on 19 February 2018, at 04:43 (UTC).